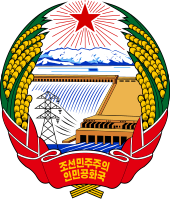 The Supreme People's Assembly (Chosŏn'gŭl: 최고인민회의; MR: Ch’oego Inmin Hoeŭi) is the unicameral legislature of the Democratic People's Republic of Korea (DPRK), commonly known as North Korea. It consists of one deputy from each of the DPRK's 687 constituencies, elected to five-year terms. The constitution recognizes the Workers' Party as the leading party of the state. The Workers' Party, led by Kim Jong-un, governs the DPRK in a monopoly coalition with the Social Democratic Party and the Chondoist Chongu Party called the Democratic Front for the Reunification of the Fatherland. Elections are held in five-year intervals, the most recent taking place in 2019. Although the Supreme People's Assembly is the primary legislative body of the DPRK, it ordinarily delegates authority to the smaller and more powerful Presidium, chosen from among its members. Under the 1972 Constitution, the number of seats in the Assembly was 655. This was increased to 687 following the 1986 election. In 1990, the composition of the SPA was 601 seats held by the Workers' Party of Korea, 51 seats held by the Korean Social Democratic Party, 22 seats held by the Chondoist Chongu Party and 13 seats held by independents. The last convention during Kim Il-sung's government took place in April 1994, three months before his death. Then during the mourning period the assembly did not meet, nor did elections take place. The next meeting convened in September 1998, four years after Kim's death. Kim Jong-il did not make a speech at the first session of the 10th SPA in 1998. Instead, members listened to a tape-recorded speech of the late Kim Il Sung, which was made at the first session of the 9th SPA, in 1991. The enhanced status of the Korean People's Army was anticipated by the SPA election July 1998, when 101 military officials were elected out of 687 delegates. This was a large increase from the 57 military officials elected during the 9th SPA in 1990. Kim Yong-nam served as president of the Assembly Presidum from 1998 until 2019. Pak Thae-song is the Chairman (Speaker), while Pak Chol-min and Pak Kum-hui are the Vice-Chairmen. On April 14, 2012, during the fifth session of the 12th Supreme People's Assembly Kim Jong Un was elected as the country's supreme leader. Addressing the SPA session, Kim Yong-nam, president of the SPA Presidium, said Kim's accession to the DPRK's top post reflected "the ardent desire and unanimous will of all the party members, servicepersons and other people". His status as leader was reaffirmed when he was elected unopposed on March 9, 2014. Kim had nominated to represent his district, the symbolic Mount Paekduto, in the assembly election. Voters could vote yes or no, with all voting in the affirmative, according to government officials. In 2017, the assembly created a subordinate Diplomatic Commission. This may be useful for international dialogue with other parliaments, while other diplomatic channels are blocked. On 11 April 2019, Choe Ryong-hae was appointed President of the Presidium. Under the Constitution of North Korea, all citizens 17 and older, regardless of party affiliation, political views, or religion, are eligible to be elected to the legislature and vote in elections. All candidates are selected by the Democratic Front for the Reunification of the Fatherland in mass meetings held to decide which candidates will be nominated and their names can only go on the ballot paper with the approval of the meeting. The Democratic Front for the Reunification of the Fatherland is a popular front dominated by the Korean Worker's Party, in which almost all power rests. The other participants in the coalition include the two other de facto legal political parties, the Korean Social Democratic Party and the Chondoist Chongu Party, as well as various other member organizations including social groups and youth groups, such as the Korean section of the Pioneer movement, the Kimilsungist-Kimjongilist Youth League, the Korean Democratic Women's League, and the Red Cross Society of the Democratic People's Republic of Korea. Only one candidate who has been selected by the Democratic Front for the Reunification of the Fatherland appears on the ballot. A voter may cross off the candidate's name to vote against them, but must do so with a red pen in front of the election officials. He must then drop his ballot into a separate box for "no" votes. Voting against the Democratic Front candidate is considered an act of treason, and those who do face the loss of their jobs and housing, along with extra surveillance. According to the Constitution of North Korea, it is the highest organ of state power in the country. The Assembly is convened once or twice a year in regular sessions of several days each. At all other times, the Presidium acts for the Assembly. Extraordinary sessions of the Assembly can also meet when called by the Presidium or by one third of the Assembly deputies. Receiving reports and adopting measures on the Cabinet. Constitutional amendments require the approval of two-thirds of the deputies. The Presidium exercises legislative power when the SPA is in recess, which occurs during all but a few days of every year. For all intents and purposes, it is the highest organ of state power in North Korea. Grant special pardons or amnesties. In addition to its executive functions, the Presidium also receives credentials of diplomatic representatives from foreign countries. Many of the powers of the Presidium derive from the 1998 constitutional amendment which abolished the posts of the President of North Korea, Central People's Committee, and Standing Committee of the Supreme People's Assembly and gave their powers to the Presidium. Of these organs, the Presidium is seen as the successor of the Standing Committee. According to the 1998 Constitution, the Presidium and the President of the Presidium succeed the Assembly's Standing Committee and the Chairman of the Standing Committee. Prior to the creation of the post of President of the DPRK in 1972, the Chairman of the Standing Committee was the country's de jure head of state. Currently, the Chairman of the Assembly is the SPA speaker, while the President of the Presidium performs representative functions ordinarily accorded to a head of state. As the representative of the state in external matters and the head of the highest sovereign organ, the President of the Presidium is often considered the de facto head of state of North Korea. The President also convenes sessions of the SPA. The President, like the rest of the Presidium, is elected by the SPA members. The SPA can also remove the President. Kim Yong-nam held the post from its creation in 1998 until 2019, when he was replaced by Choe Ryong-hae. In addition to the Presidium, the SPA has four parliamentary committees: the Foreign Affairs Committee, Budget Committee, Legislation Committee, and Deputy Credentials Committee. The constitution mandates the Legislation and Budget Committees and leaves the choice of having more committees to the SPA. Before 1998, the tasks of the Presidium was exercised by a Standing Committee and there was and additional committee called the Reunification-policy Deliberation Committee. The Foreign Affairs Committee, too, was discontinued in 1998, but as of 2019[update] is operating again. The Foreign Affairs Committee is chaired by Ri Su-yong. The other members are Ro Ryong-nam, Ri Son-gwon, Kim Jong-suk, Kim Tong-son, Choe Son-hui, and Kim Song-il. The Budget Committee is chaired by O Su-yong. The other members are Hong So-hon, Pak Hyong-ryol, Ri Hi-yong, Kim Kwang-uk, Choe Yong-il, and Ri Kum-ok. The Legislation Committee is chaired by Choe Pu-il. The other members are Kim Myong-gil, Kang Yun-sok, Pak Jong-nam, Kim Yong-bae, Jong Kyong-il, and Ho Kwang-il. The Deputy Credentials Committee is chaired by Kim Phyong-hae. ^ "DEMOCRATIC PEOPLE'S REPUBLIC OF KOREA Choe Go In Min Hoe Ui (Supreme People's Assembly)". Inter-Parliamentary Union. 5 August 2014. Retrieved 3 January 2018. ^ "DPRK Holds Election of Local and National Assemblies". People's Korea. Archived from the original on 2013-03-31. Retrieved 2008-06-28. ^ Gorvin, Ian (1989-01-01). Elections since 1945: a worldwide reference compendium. Longman. p. 196. ISBN 9780582036208. ^ Publications, Europa; Staff, Europa Publications; 32nd, Ed (2017-04-25). The Far East and Australasia 2001. Taylor & Francis Group. p. 597. ISBN 9781857430806. Archived from the original on 2017-04-26. ^ a b c d e f g h i j k l m n o p q r s t u v w x y z aa "In full: promotions and demotions at North Korea's 14th SPA". NK PRO. Korea Risk Group. 12 April 2019. Retrieved 17 April 2019. ^ Frank, Ruediger (28 April 2017). "The North Korean Parliamentary Session and Budget Report for 2017". 38 North. U.S.-Korea Institute, Johns Hopkins University School of Advanced International Studies. Archived from the original on 28 April 2017. Retrieved 1 May 2017. ^ "N.K. leader re-elected as chairman of State Affairs Commission". Yonhap. Retrieved 12 April 2019. ^ "North Korea votes for new rubber-stamp parliament". Associated Press. 8 March 2009. ^ Alma Milisic (19 July 2015). "Foregone result in North Korea's local elections". Al-Jazeera English. ^ Frank, Ruediger (8 April 2016). "The 2016 North Korean Budget Report: 12 Observations". 38 North. U.S.-Korea Institute, Johns Hopkins University School of Advanced International Studies. Archived from the original on 4 May 2017. Retrieved 1 May 2017. ^ Madden, Michael (5 April 2013). "Kim Jong Un's Pyongyang Shuffle". 38 North. Retrieved 16 October 2018. ^ Cha & Hwang 2008, p. 201. ^ Minnich 2008, p. 276. ^ Cha & Hwang 2008, p. 196. ^ a b c d e Cha & Hwang 2008, p. 198. ^ "6th Session of the 13th SPA Held". North Korea Leadership Watch. 14 April 2018. Retrieved 16 October 2018. ^ a b "First-day Meeting of First Session of 14th SPA Held". KCNA Watch. 12 April 2019. Retrieved 18 April 2019. ^ "Socialist Constitution of the Democratic People's Republic of Korea". 2016. Chapter VI, Section 1, Article 98. Retrieved 25 October 2018. Cha, Victor D.; Hwang, Balbina Y. (2008). "Government and Politics". In Worden, Robert L. North Korea: A Country Study (PDF) (Fifth ed.). Washington: Federal Research Division of the Library of Congress. pp. 187–234. ISBN 978-0-8444-1188-0. Minnich, James M. (2008). "National Security". In Worden, Robert L. North Korea: A Country Study (PDF) (Fifth ed.). Washington: Federal Research Division of the Library of Congress. pp. 237–281. ISBN 978-0-8444-1188-0. Wikimedia Commons has media related to Supreme People's Assembly. FACTBOX - North Korea's main political bodies and power, Reuters.